Great staff. Pricey but absolutely delicious food at Carmichael’s. Hard to get to the pool but had it to ourselves. Good quality rooms. Nice location, just 10 min drive from the fantastic Rim walk. Very good breakfast. Lovely staff, got upgraded to a better room, and were Full of suggestions for what to do around the area. Good pub on the resort. We were upgraded to a Spa suite. Rooms are a little tired but to be expected in such a remote location. Breakfast was excellent. We were lucky to get an upgrade to a standard room (from the budget quad). The staff was exceptionally friendly and knowledgeable. The room was nice, clean, and had a nice view from the balcony. 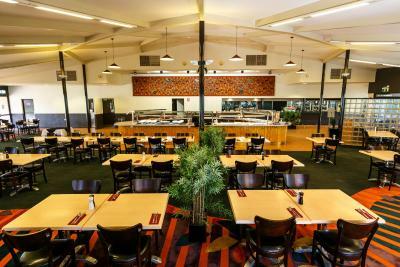 We read many bad reviews about the Carmichael restauant and we were pleasantly surprised that it was actually excellent. This is basic accommodation and what you see if what you get. But since you will probably only spend 1 night here its fine. It was quiet and close to amenities and sunset strip. Room very comfortable, shower was great but balcony was not private. Nicholas at the front desk was awesome and went above and beyond in locating our lost camera. Family room was basic as expected. The location is the only reason to stay here. If you’re coming from the north it’s the only place to stay inside the park, and going he extra distance to the next place is another 30km or so. Also the staff is nice and the night we were there had a guitarist playing and he was GREAT! 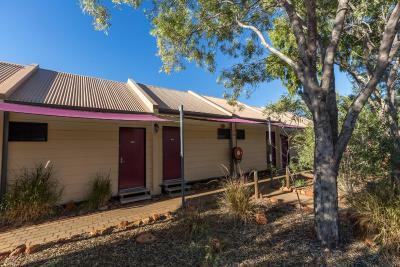 Kings Canyon Resort This rating is a reflection of how the property compares to the industry standard when it comes to price, facilities and services available. It's based on a self-evaluation by the property. Use this rating to help choose your stay! 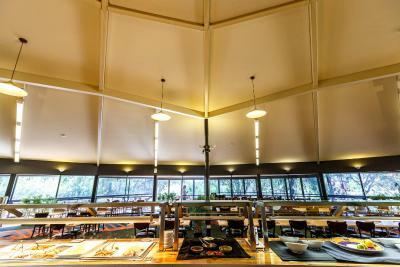 Between Ayers Rock and Alice Springs, Kings Canyon Resort offers 2 restaurants, 2 swimming pools, and a gas station. 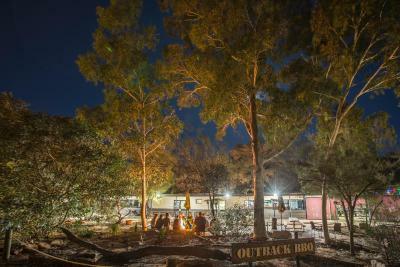 It features outback campground rooms and a unique outdoor dining experience. Kings Canyon Resort facilities include a tennis court, general store, souvenir shop, shared laundry facilities and gas station. Tour desk and postal services are also available. 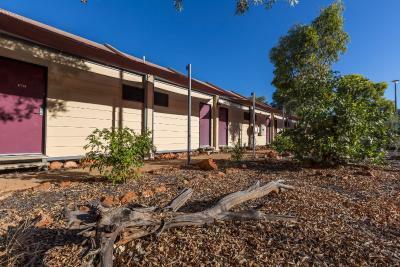 Guests can chose between backpacker accommodations in the outback or private rooms. All units contain insect screens, air conditioning, tea/coffee making facilities and extra blankets. Interconnecting rooms are available. Guests can use the resort's outback barbecue and grill facilities or choose a private 6-course campfire gourmet dining experience. Kings Canyon is a 3 hour drive from both Ayers Rock (Uluru) and Alice Springs. Watarrka National Park is 4 miles away. This property also has one of the top-rated locations in Kings Canyon! Guests are happier about it compared to other properties in the area. 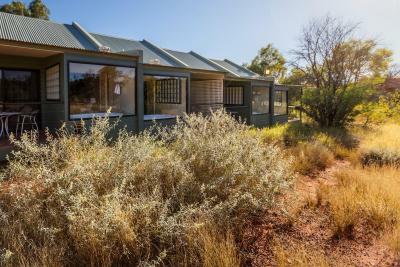 This property is also rated for the best value in Kings Canyon! Guests are getting more for their money when compared to other properties in this city. 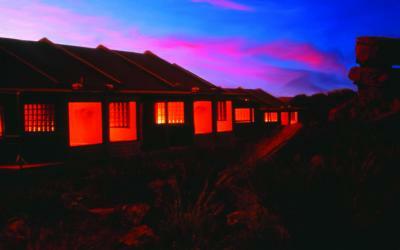 When would you like to stay at Kings Canyon Resort? 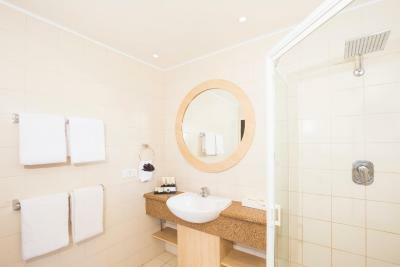 Comfortable and spacious room, features a private bathroom with shower and bathtub. Features uninterrupted range views from the large hot tub and private balcony. 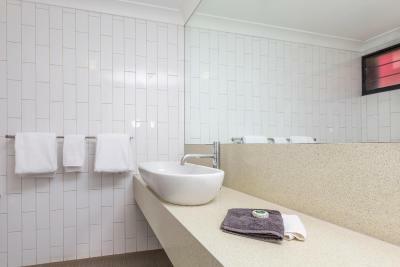 These rooms have access to shared bathroom and kitchen facilities. They feature evaporative cooling, blankets, a refrigerator, linen, tea and coffee-making facilities, and a TV. 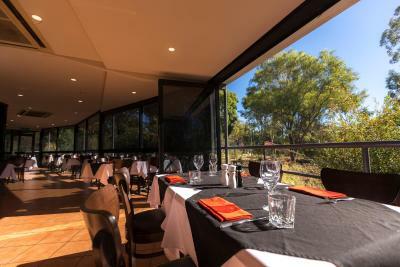 Kings Canyon Resort is located between Uluru (Ayers Rock) and Alice Springs in the Northern Territory. 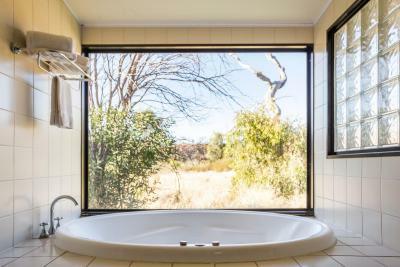 Nestled in the heart of Watarrka National Park, the resort is just nine kilometres from the iconic Kings Canyon. 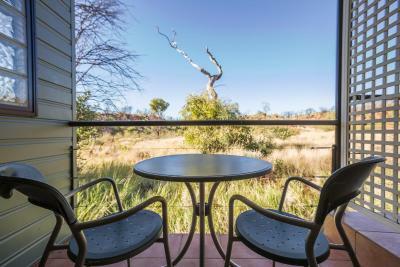 Visitors can choose from hotel style accommodation at the Resort, or an unspoiled wilderness experience within the Holiday Park caravan and campground facilities. Temperatures vary dependent on season, ranging from 18-48° C during Australian summer, and more moderate temperatures of 0 - 30° C during the winter months. WiFi is available in all areas and costs AUD 10 per hour. 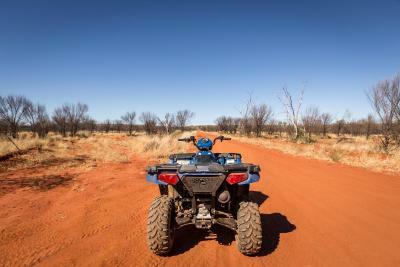 House Rules Kings Canyon Resort takes special requests – add in the next step! Kings Canyon Resort accepts these cards and reserves the right to temporarily hold an amount prior to arrival. Basic & clean accommodation. Quite expensive for what you get. The breakfast buffet was good. Check in was very slow & confusing. The outback bistro for lunch had pretty poor food options and our room had a slight sulphury smell which we understand comes from the water. This resort is expensive compared to Crowne Plaza in Alice Springs etc but understandable given isolation. Slightly overpriced but no price tag really to get all such amenities in the modst of a desert. Could add a microwave in the rooms which would be good for families with special food requirements so they can bring their own food and heat it up. Wifi not reliable but again wont expect it in the middle of nowhere! Dinner could be improvised with more options for the vegetarians and brekky could include non dairy options for lactose intolerants. Very clean. Many review mentioned stinky bathrooms. Definitely not the case. Very clean and fresh and sticked with all basic amenities including cleaning linen/towels and very nice toiletries and the shower was good flow and as luxurious as you may imagine in the midst of nowhere. No plumbing issues at all (as mentioned in many online reviews). Ironing facility as well as hair dryer in room. Guest laundry available in the block. Pool was clean but too cold to take a dip Breakfast was good (though would have loved soy or almond milk option) But all in all a great stay! Our room needed maintenance. The wardrobe right hand side door hinge needed adjusting to allow the door to shut. The top hinge on the bathroom door was not attached to its mounting causing the door to fail on closing. The man hole cover above the entry door was hanging down needing to be secured. I reported the 3 problems for safety reasons & they were corrected immediately. Their was no tea towel in our room. The door key failed & required replacing as we only had one key when we first arrived. The cleaning staff manager immediately corrected this problem. Their are no toilets at the reception building. The reception had no bus drop off or pick up times displayed & this led to some confusion. The resort needs signs located at key bus drop off & pick up locations for all guests to understand. Rubbish under trees & other vegetation was disappointing to see on cultural land. This place is a stopping point between YULARA & Alice Springs. 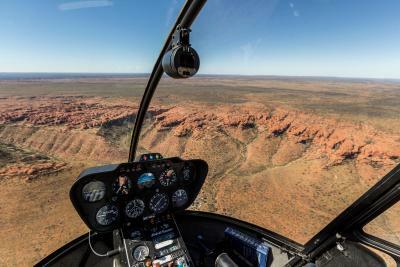 We took a per booked 55 minute helicopter flight from Kings Creek resort/food & helipad location with Ayers Rock Helicopters. 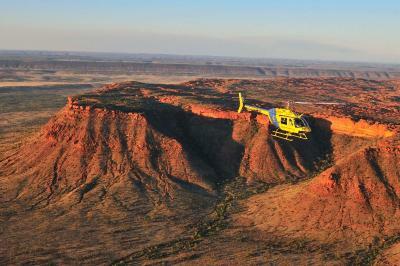 Our pilot is a young person who at times musters cattle using a helicopter. We flew over ruggered country. Saw camels, wild horses & cattle. Flew along narrow ravines & up over ancient rocky eroded land. This is a must do thing when going to Kings Canyon Resort on your journey. The pilots name was Tristin an very knowledgeable person. One other thing you have the option of flying with the helicopter doors off. Go watch the sun set behind the bar & bistro on top of a sand hill. You can buy drinks while you take photos & watching the sun go down. Would recommend. The resort restaurant serving breakfast as part of the accommodation is a good thing. A night time meal was nice. Their is no phone or internet service great. It lets you get to know people you encounter when walking around. People come for multiple countries & parts of Australia. Store didn't have much variety and was expensive. The beds were uncomfortable. The dining facilities were great, as was the sunset viewing area. Staff were friendly. The other options for dinner were not great. The breakfast buffet was not worth the money. Very limited lunch options. For the price the rooms were very run down and basic. The dinner options at the restaurant were excellent but expensive. Location was great, especially for the sunset viewing. Room was very big. $341 per night is over the top but remote = expensive. Luckily the breakfast was included. Take cash & avoid the 1% surcharge for Visa etc at all facilities. Being a lodge with a camp kitchen, I was expecting there would be pots and pans and maybe come cutlery. The absence of this should be spelled out in their advert. It meant we could not cook some of the food we had brought with us. The scenery, the sunsets and the quietness. The shop carried essential supplies and some meal items that didn't require cooking. Staff unfriendly. Soap dispensers left empty in toilets for 3 days we were there. TV didnt work in our room. We were told Tech coming to fix it later that day. 2 days later stil not fixed! No apology or update on progess of having it fixed. Wouldnt call it a resort! Its a campground. Pool was dirty looked like it hadnt been cleaned in a long time. Lots of floaties! Air con in room low fan setting only. Unable to turn fan up so cooling the room took forever. Room was close to amenities. Nothing. I loved the area we got upgraded to. I liked that we got an upgrade after the 6km rim walk. A lot of room. Bathroom was large. It has a bath. Peaceful area. Laundry. We stayed in the units and used the shared bathrooms,could do with a bit of an upgrade.